Perfect size. Look nice. Not too heavy. Easy to move. Have to drill your own holes for anchor parts. 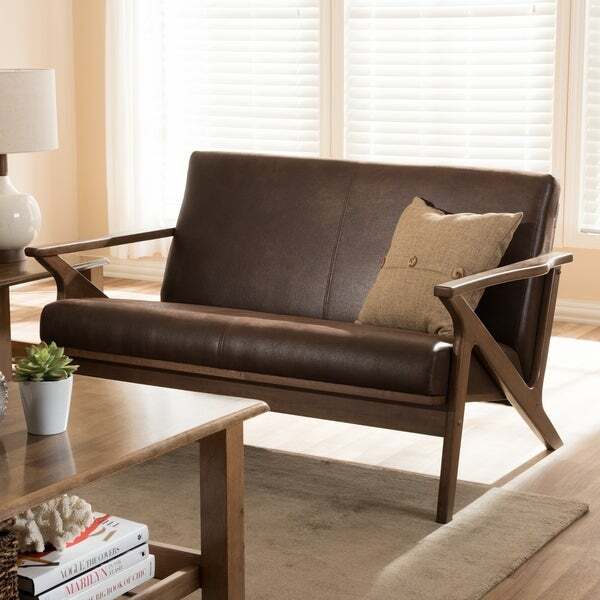 Welcome plush comfort into your home with the vintage style Bianca 2-seater loveseat settee. 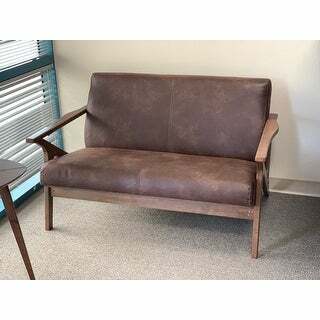 Constructed of durable rubberwood for exceptional durability and stable comfort, the Bianca is upholstered in distressed brown faux leather or polyester fabric to give it a vintage feel. Perfect for a modern or minimal interior, the Bianca features smooth angular solid wood frame in dark walnut finishing for a nod to mid-century modern design that exudes warmth. Dimensions 34.0 In. X 50.0 In. X 30.0 In. The quality is fantastic! The seats are firm but comfortable. It has a very clean look! I highly recommend! I was a little worried about the faux leather but it looks and feels very nice! I've gotten so many compliments on this loveseat! The style is simple and classy. It's also very comfortable and easy to assemble! 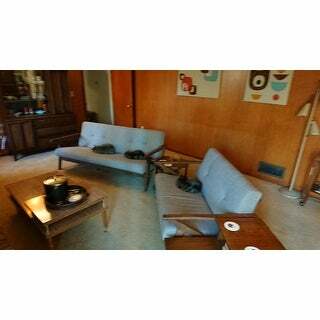 This loveseat is exactly what I was looking for for our mid century modern living room remodel. The wood is a beautiful walnut stain and the fabric is a nice quality. It was easy to assemble and is very sturdy. We love the final look! Assembly required and it was easier with two people. Screws are a little challenging to align, which makes holding the arms to the frame and aligning the screws a two person effort. 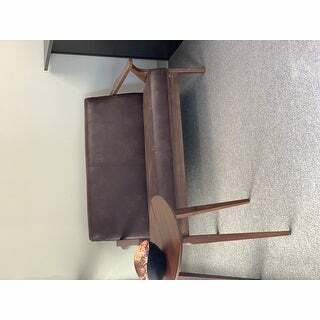 Like the grey linen and brown/chestnut finish. There's not a lot of "cushion" to this seat and back. So if you prefer something plush, this is not it. However, it is still comfortable to sit on for extended periods of time. The whole experience with these things was extremely sub-par right from the get-go. The packages arrived at separate times. Upon unpacking, I noticed just a general all-around lack of QC. There was saw dust on everything...the edges of pieces had scuffs. There were lots of minor blemishes in the finish, and one major blemish that was just absurd. Then there is a portion of the frame that is pre-attached to the back cushion with screws, except one of the screw holes was stripped, so there was a gap in that area with no way to resolve it. Assembly was a nightmare as they rely on metal inserts into which bolts are driven. But these inserts sit too far into the pocket. So you have to carefully place them so they don't go in too far and will line up with the bolt...and you'll do this while more/less balancing heavy pieces as to make them align. I've put together dozens if not hundreds of pieces of furniture in my day and this was one of the worst. Even if the products weren't blemished and even if they came pre-assembled...I wouldn't trust it to hold a few full-grown adults. The general design is that the main seating surface is hanging on the side arms via 2 bolts. A few larger adults plopping their whole wait down on this and I could easy see it cracking. So even if they arrived in good quality, were pre-assembled, and were of a confident and sturdy design, the cushions are still very poor quality. They're stiff as *** and very basic and cheap. They look like *** furniture. Honestly...the fact that Overstock is charging what they're charging for these is kind of a slap in the face. I had been toying with building my own, and I think this experience was proof that I can't do any worse than what you'll get with this garbage. Absolutely LOVE this loveseat! I purchased this for our front office. It is beautiful, well made and comfortable. I wish we had room for the other pieces that go with this. Ordered the fabric version of this loveseat. Nice quality. Fairly easy to put together, took about thirty minutes. Only negative is the cushion is a little hard. Looks nice and fairly comfortable. Reasonably easy to assemble. It fits the space perfectly, look exactly as the picture and is well constructed. Really love the look of the pair of love seats. Product didn't come with any of the hardware. Unfortunately I now have to wait another week to put this together.